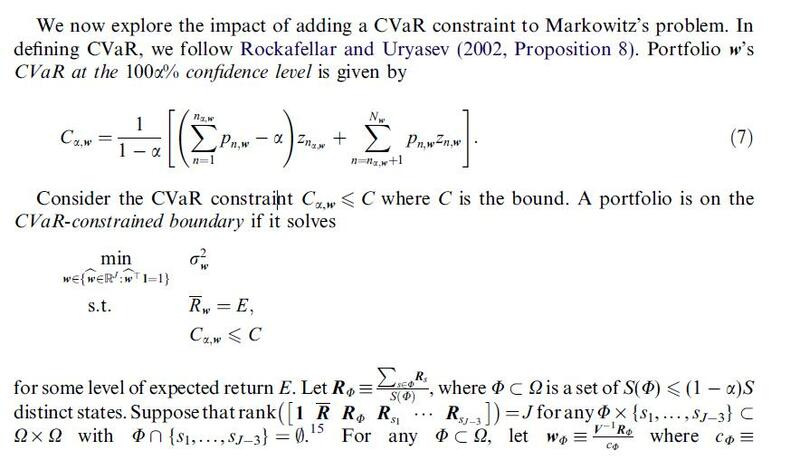 I wanted to optimize a portfolio based on a portfolio-wide CVaR constraint (i.e. $CVaR_p \leq 0.08$). Unfortunately, I only find solution that minimizes the entire CVaR of the Portfolio. Do you mind telling me if I need to add a restriction or how to change the utility function? I removed some stupid elements. I will give a full answer once I finished the semester at the university. Writing a linear solver with a CVaR-Constraint is time-consuming. "Portfolio Safeguard" of "American Optimal Decision Inc." is optimized for such kind of problems. Later I will illustrate the process. Not the answer you're looking for? Browse other questions tagged portfolio portfolio-optimization cvar or ask your own question.